Community bulletin is a block displayed in the top right part of the site which shows some of the questions on meta (and sometimes also some other stuff). It is useful, because it attracts attention to issues which were raised on meta (and possible without being shown there they would go unnoticed). And I suppose that some users use community bulletin also as a quick way how to get to meta. Today I have noticed that it is no longer displayed on MathOverflow - but I still see it on other sites (for example, Mathematics, Physics, TeX). I will add that there are posts on meta which are eligible to be displayed there. 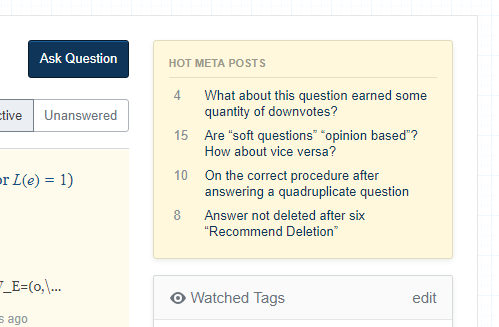 For example, the questions On convexity tags is tagged discussion, it is less than two weeks old and it has score well above 3. (And I distinctly remember seeing it in the community bulletin yesterday.) So the community bulletin wasn't hidden simply because there are no items to display. Why was community bulletin removed? Could this be corrected? Here is a screenshot showing what I see on the page with question in the place where the community bulletin used to be. 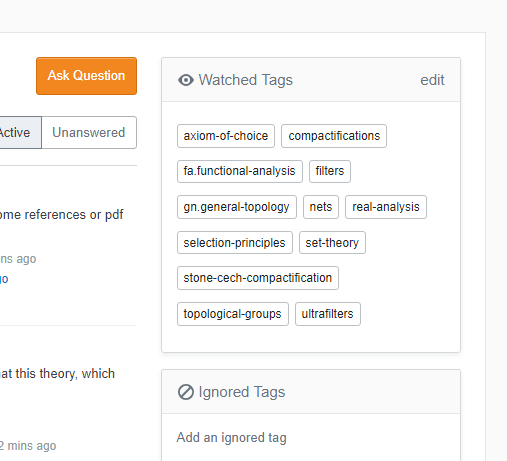 Here is a screenshot from Mathematics Stack Exchange - where the community bulletin is displayed. EDIT: Now it is shown again. I do not know whether this was just some temporary glitch or whether the issue was corrected so fast. Browse other questions tagged bug community-bulletin .